Leads to less hassle, less wasted time, a better working environment and increased customer retention. Configurable branding and layout so that your visitors see a consistent and slick system across all your devices. 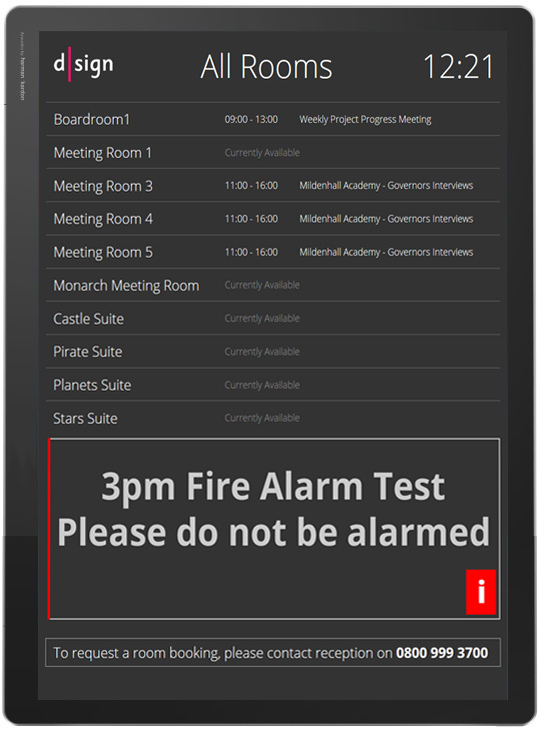 Display event information on large screens, on line & outside individual rooms. Reach the greatest audience with the greatest influence. 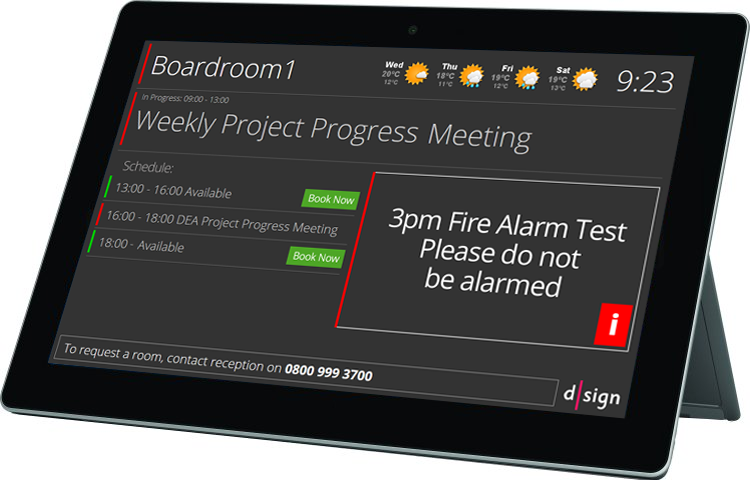 Clear on screen and online access to room schedules to find and manage available meeting space, book via your existing system, at screen level or online. 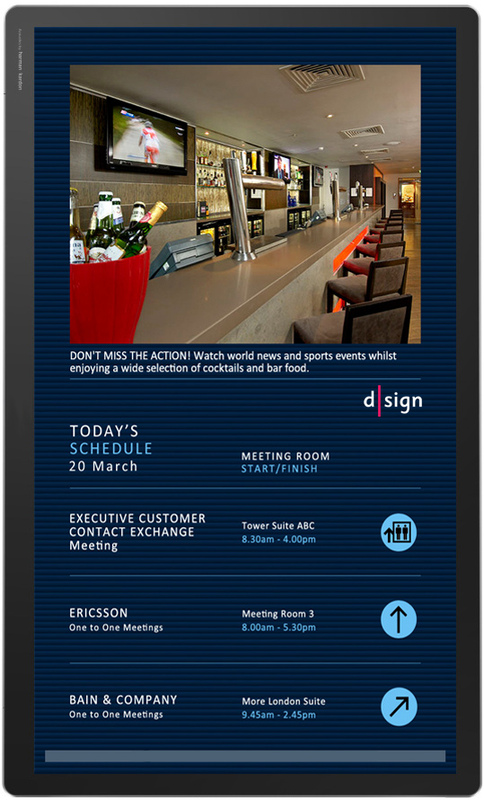 Add detailed event media, graphics and messages to personalise your event experience. 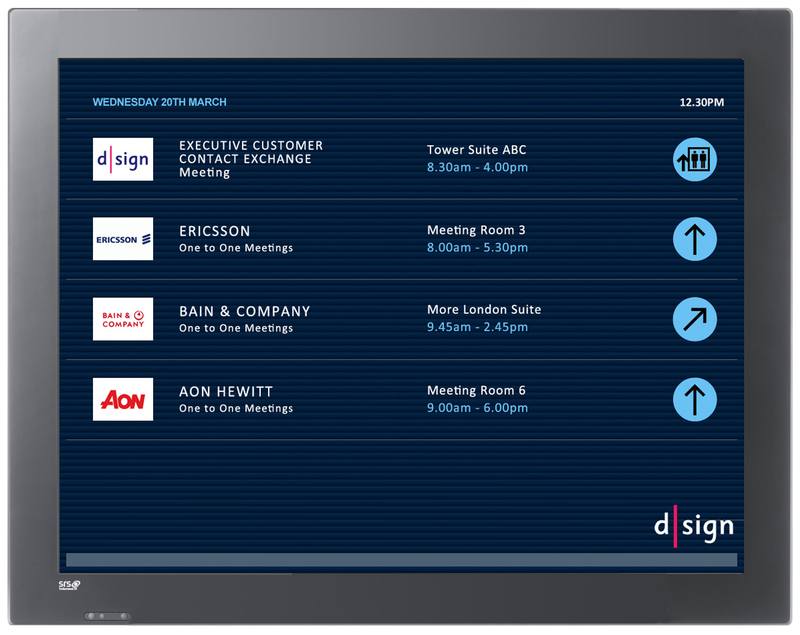 Integrated with d|sign-in and d|sign Wayfinding to manage visitor flow. Whether the focus of your event space is internal meetings, organisation visitors or the general public, you can easily setup the system to best suit the needs of the attendees. Make sure everyone is aware of the all important exam schedule by using d|sign Events. 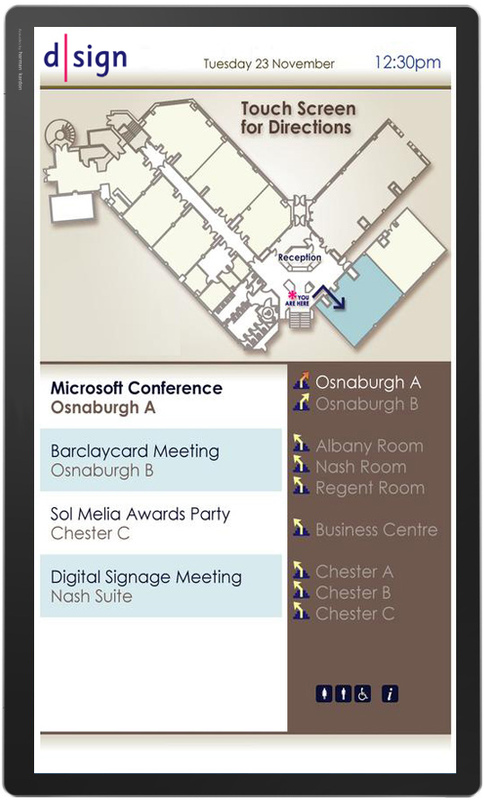 A large format wall screen or counter top display positioned at entrances and receptions to give an overview of rooms and \ or events taking place. Show your live event information and status on your own website so that visitors can find out everything they need to know before even arriving. Make your events reoccur so you never have to worry about space being available for the monthly board meeting or school assembly. 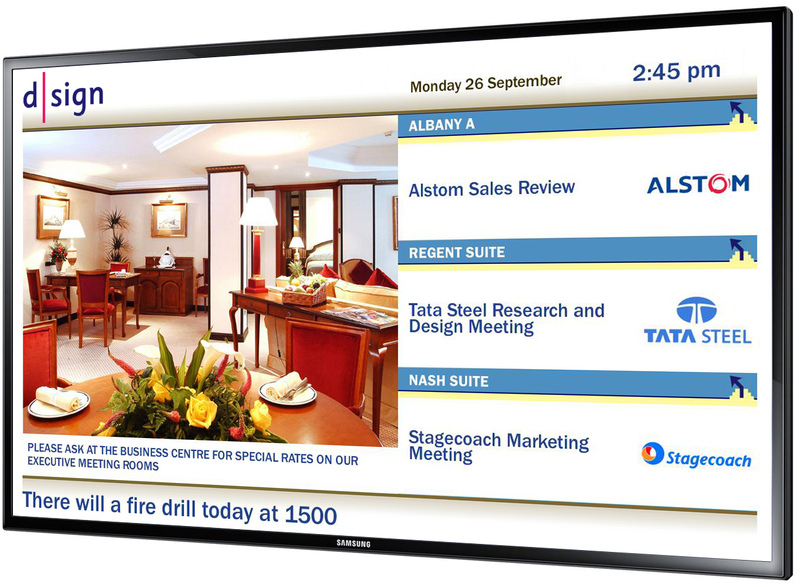 With a range of options for each display type the system works the way you need it to, whether you are a conference centre, an events venue, managed offices, a hotel, a hospital or a school. Your focus may be the venue, people, space or the event, but whether there are people coming together - d|sign Events will help you manage it effectively. 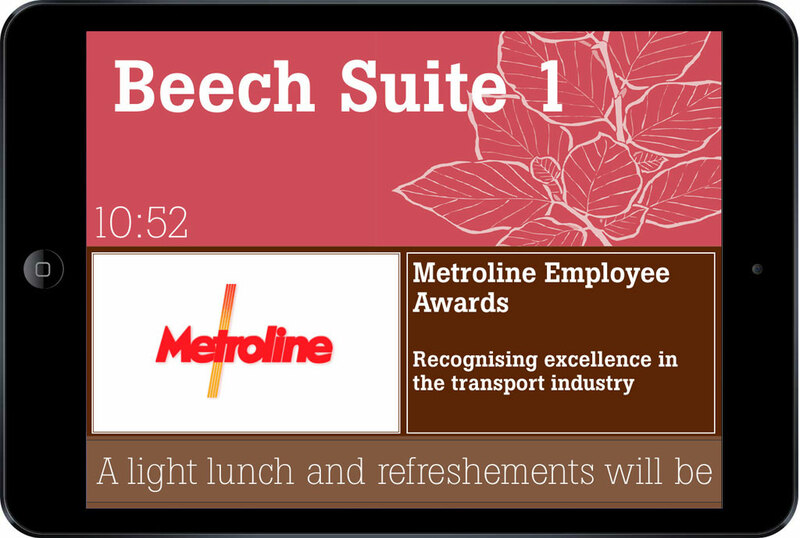 Personalise all the displays with your logos, media, colours and text so that the screens really represent your organisation.